From research on local government to global carbon emissions, ASU’s School of Public Affairs was well represented by faculty and students at the 38th annual fall research conference of the Association of Public Policy and Management (APPAM), from November 3 to 5, in Washington, D.C. Research topics included religion, online college attendance, social media, participatory budgeting, sustainability, voluntary regulation, child care, weather risks and transit, natural hazards, and the relationship between academic research and policymaking. ASU Faculty and students presented 9 papers, 2 posters, and participated in 1 roundtable discussion and in 6 panels as organizers, chairs or discussants. Nine faculty who participated included Lily Hsueh, Nicole Darnall, Mary Feeney, Barry Bozeman, Stu Bretschneider, Ulrich Jensen, Eric Welch, Chris Herbst, Brian Gerber, and Jonathan Koppell. 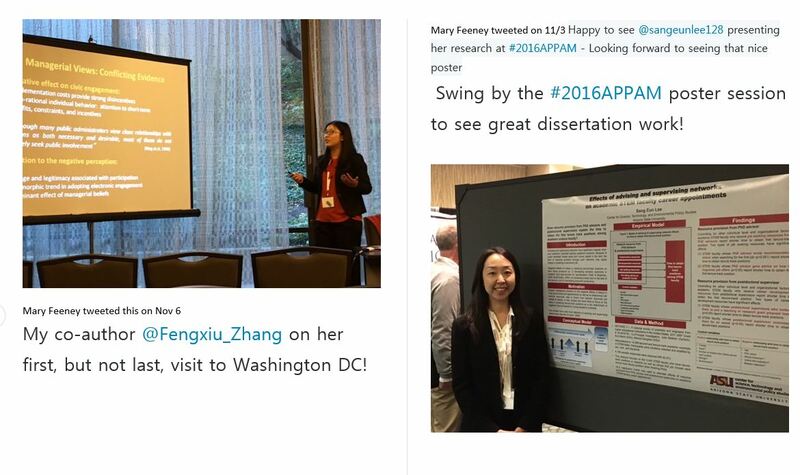 Doctoral students who presented papers or posters included Gabel Taggart, Won No, Fengxiu Zhang, and Sang Eun Lee. Social Media and Citizen Engagement: What Do Bureaucrats Think?